Plaques show recognition for individuals who go above and beyond the minimal requirement. Design your own award plaque for achievements such as Employee of the Month, Student of the Quarter or Teacher of the Year. 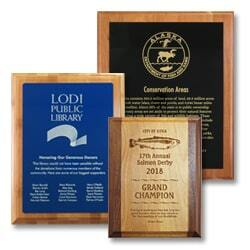 However you use them, these customizable plaques are sure to make a great impression. Show appreciation for your colleagues at office parties or corporate events with these custom Value Plaques. 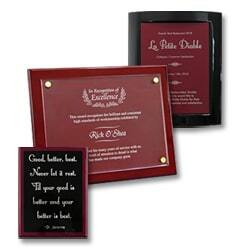 Customize these Standard Plaques to motivate your associates or congratulate someone for a job well done. 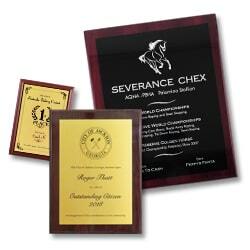 Turn these Premium Plaques into mementos for special occasions or awards that winners will cherish. Get all the ribbons you need in one convenient location. 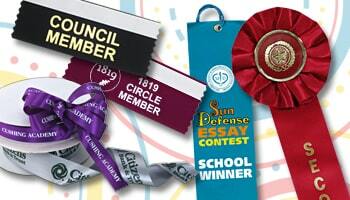 Whether they are for weddings, contests, trade shows or other events, we have the perfect ribbons for you. 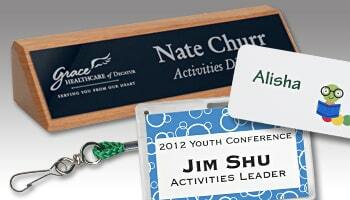 Add value to your workplace with quality name tags and name plates. We also have the lanyards and name badges you need to promote your brand at any event. Personalized Ribbons and Name Tag, Inc. are part of the Coller Industries Incorporated family. Our product sites give you access to a wide variety of quality items, from name tags and lanyards to signs and custom ribbons. Satisfaction and Quality Guarantee: At Coller Industries, we believe customers always come first. We recognize you are placing your trust in our work when you order through us. And we honor that trust by giving you the best products for the best price with unmatched customer service. We have achieved a less than 1% error rate for the past five years. Every order is checked twice before it is shipped. Any problems are handled on a case-by-case basis to ensure customers get exactly what they want. Our friendly customer service representatives are always available to answer any questions and guide you through the ordering process.